I love Pancake Day. I grew up in a frugal household and money was tight. Pancake Day was one of those occasions where we had a veritable carb fest. The pancakes were of the English variety and we filled them with cheese sauce as a main course, then had them with sugar and lemon for pudding. Yum! Pancake Day falls 47 days before Easter and the day before Ash Wednesday, so somewhere between 3rd February and 9th March. Traditionally, it’s known as Shrove Tuesday. Christians confess their sins before Lent and thus are said to be ‘shriven’. It was also a time to clear the house of any rich foods, especially eggs, before the big fast when those foods could no longer be eaten. For this reason Pancake Day is also called Mardi Gras (Fat Tuesday) in parts of Europe and many South American countries. This year Pancake Day falls on Tuesday 5th March. 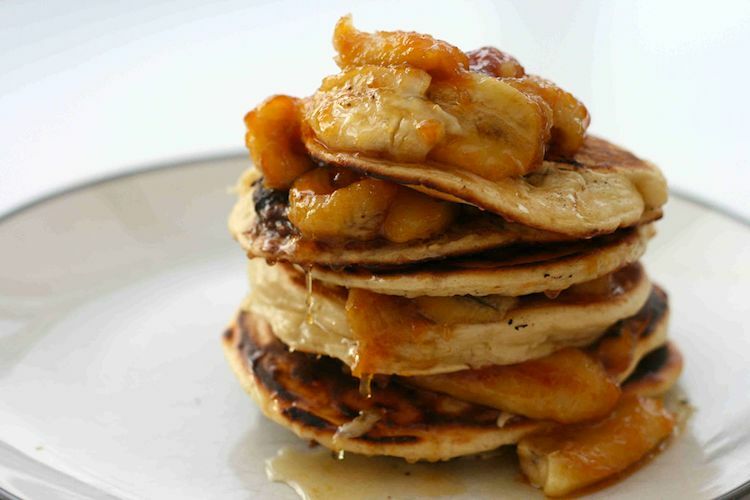 Can’t wait until then to make these 4 fluffy pancake recipes? Go ahead and make them now. Pancakes should be eaten with regular abandon. #CookBlogShare is a weekly linky party where the food love is liberally shared. Yes, it’s me doing a round-up again and I’ve really enjoyed looking at these 4 fluffy pancake recipes in detail. I do miss those #WeShouldCocoa days. Thanks to #CookBlogShare co-hosts Jacqui of Recipes Made Easy, Monika of Everyday Healthy Recipes and Eb of EasyPeasyFoodie for entrusting me with this week’s highlights. Thanks also to everyone who shared recipes in last week’s linky. There was plenty there to whet my appetite. Pancakes are one of the best comfort foods out there and they are so easy to make too. Have them for a luxurious breakfast, enjoy them for dessert or try a savoury version as a full on main meal. These kefir kale pancakes served with tomato sauce, spiced lentil pancake wraps or pea protein pancakes with a spicy peanut sauce all work well as a savoury dish. Any which way you have them, pancakes are always good. 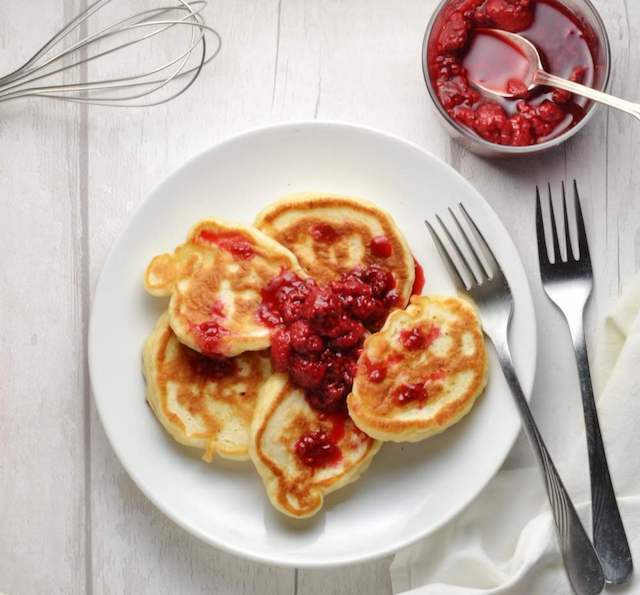 So with Pancake Day not far away now, I had to pick pancakes from last week’s #CookBlogShare linky hosted by Monika at Everyday Healthy Recipes. Talking of Monika, the first pancake recipe to grab my attention was her intriguing Polish pancakes with yeast aka racuchy. I’ve tried a lot of pancakes in my time, but to the best of my knowledge, not Polish ones. Don’t be put off by the yeast, Monika assures us, the racuchy are easy to make. They’re also light and fluffy to eat. Serve with Monika’s vibrant raspberry compote or maybe try her easy chocolate sauce or even orange sauce instead. As you know, I heartily approve of chocolate and it goes remarkably well with pancakes I find. These chocolate and banana pancakes from Cooking With My Kids sound gorgeous and are just a little bit different. Bite into them and you’ll find a puddle of chocolate spread cunningly hidden in the middle. Plus they’re served with fried bananas. What’s more Helen gets her kids to help prepare the pancakes. Perfect preparation for future breakfast-in-bed opportunities I reckon. And there’s more chocolate. Hooray! 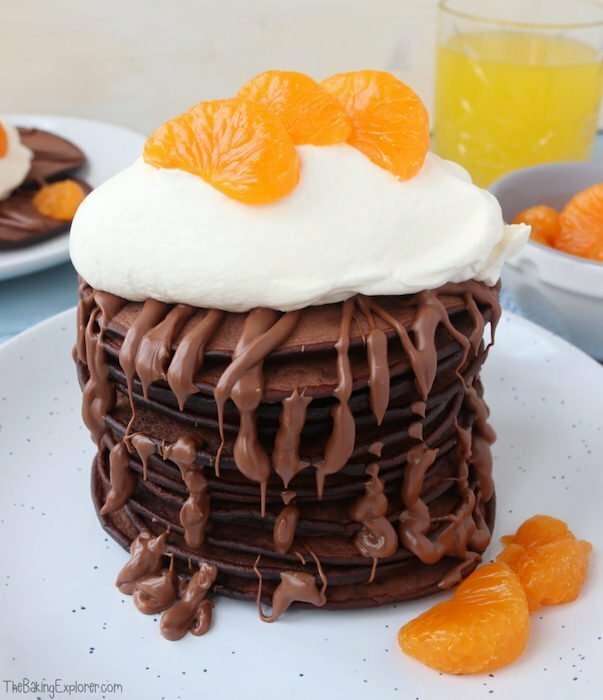 If you like the combination of chocolate and orange, you will love these chocolate orange pancakes from Kat at The Baking Explorer. Her hot tip is that you can make these pancakes in advance and reheat them just before serving. Topped with melted orange chocolate, whipped cream and orange slices, these pancakes would make a glorious dessert. American pancakes are for everyone, not just Americans. 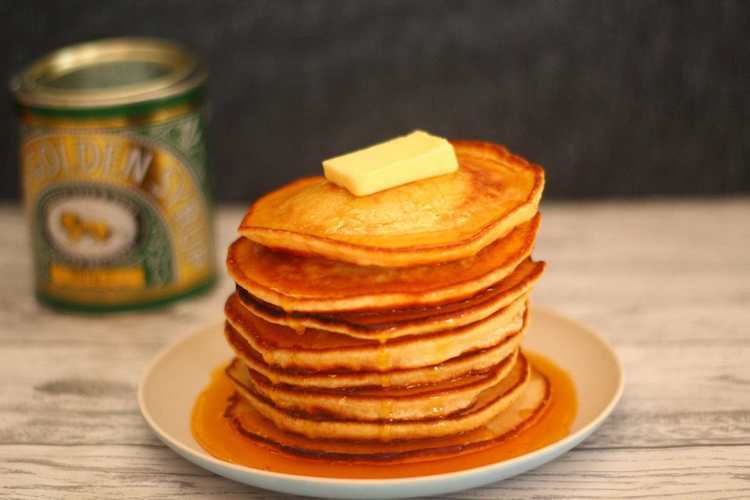 This wonderful stack of easy fluffy American pancakes is from Jenny over at Apply to Face Blog. Apparently they’re her daughter’s favourite breakfast and a weekend staple at her house. Jenny, I’m on my way! You can serve them with maple syrup of course, but why not try the very British golden syrup instead? Make sure you read the post to find a very handy tip for not burning your pancakes. Add a link from your post back to this post. This helps everyone else find it and link up too. Comment on some of the other recipes linked up here (at least 2 for each link you added but the more you can the better) and generally share the love with a bit of social media action. Comment on either this post or one of the posts labelled HOST in the linky. I will endeavour to visit every post that’s linked up this week and pin the recipes to the Pinterest #CookBlogshare board. I’ll try to comment on all of them too. You might even get some yums, flips or mixes. If you tag me on Twitter at @choclette8 and co-hosts @jacdotbee @easypeasyfoodie @MonikasRecipes, using the #CookBlogShare hashtag you should get a retweet or two. I’m really looking forward to seeing all the recipes you share this week. Have fun and thank you for joining in with #CookBlogShare. By joining in you are giving the #CookBlogShare hosts permission to use your pictures in a round up and on social media, if your recipe is selected to be featured. Please use #cookblogshare when sharing your recipes on Instagram. We could all do with some help there. Once you’ve posted, quickly hop over to the #CookBlogShare feed, liking as many as you can and commenting on any that particularly catch your eye. Do post your recipes on the Cook Blog Share Facebook Page if you’d like to. Your host next week will be Eb at Easy Peasy Foodie. 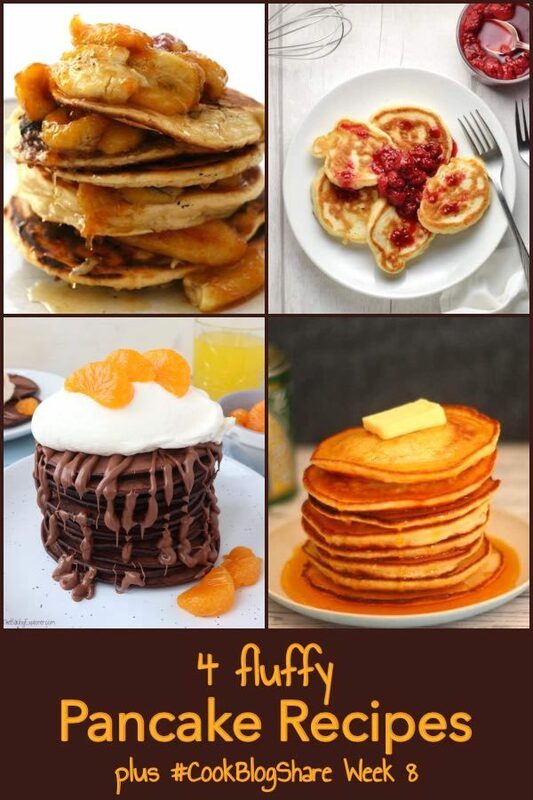 4 Fluffy Pancake Recipes. PIN IT. Ah, just too late to make 5 fluffy pancakes instead of 4. Thank you for featuring my racuchy! And the lovely write up! I’ve just linked up a vegetarian appetizer recipe. Will be back later to see what others have shared. I’m definitely going to have a go at your racuchy. Love the idea of using yeast. Thanks Eb. I’m with you on pancake day in March. I don’t remember that every happening before either. It doesn’t feel quite right. So many delicious pancakes, I really must make some soon! Ooohh, I saw this just in time for the weekend. These all look so delicious. Hello, brunch! Thanks for hosting this week, Choclette! Pancakes are calling to me too for a lazy Sunday brunch this week – how could they not after this round of fluffy pancake deliciousness. You and me both Jenny. Pancakes it is this weekend then.